We can’t really think of many situations that wouldn’t be made better by sushi. But procuring said sushi is not easily when you are in the midst of an all-night coding or cramming session. 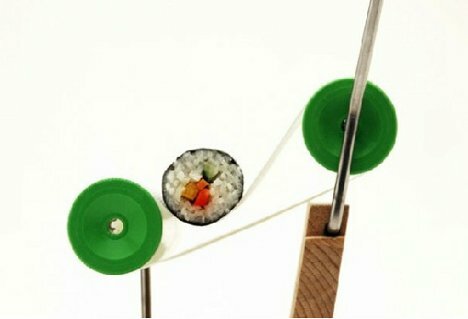 Hence this killer sushi roller device from German designers osko+deichmann. 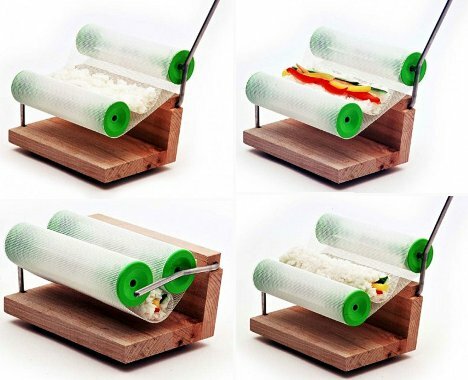 Working on the same idea as a tobacco roller, the German Sushi Roller churns out perfect rolls almost effortlessly. You slap down the rice and veggies, roll it all up and then insert the nori. As the rollers turn, the seaweed is wrapped tightly around the filling ingredients. All you have to do from there is remove it and slice it – or bite right in, you barbarian. We love the leap of creativity that it took to apply cigarette rolling principles to the production of one of the world’s most delicious meals.